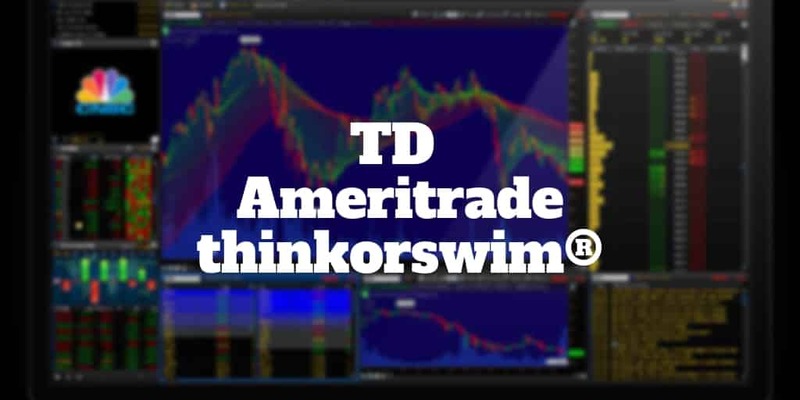 Home › Investing › Broker › What Is TD Ameritrade thinkorswim? What Is TD Ameritrade thinkorswim? thinkorswim is a trading platform owned by TD Ameritrade and aimed at experienced stock, options, and futures traders who are price-sensitive and seek advanced tools, screeners, and charts. Once you create an account with TD Ameritrade, you can use thinkorswim free of charge. It’s a downloadable desktop platform that provides free real-time quotes, hundreds of chart studies, options risk graphs and more. Beginners or less active traders also have the option to invest via the firm’s web platform, but thinkorswim has advanced features for more experienced investors and those who make frequent trades. Why thinkorswim For Online Trading? How Much Does It Cost To Open A thinkorswim Account? There is no account fee and no minimum balance to get started with thinkorswim. thinkorswim provides both commission-free ETFs and those that have commissions. It also offers a select list of no-transaction fee mutual funds. The Analyze interface includes multiple tools for exploring various investments from all angles. You can simulate various real-life scenarios, potential trades and examine volatility. Play out simulated trades, analyze risks, review economic data or project earnings reports. thinkorswim incorporates a social trading tool, myTrade, where you can share knowledge and strategies. Trade feeds aggregate those trades you and others share on myTrade. You can also locate videos pertinent to specific market symbols, access useful gadgets, and check the status of your orders. thinkorswim provides you with a fully loaded toolbox. To analyze data, simply enter a stock, option, forex or futures symbol, and thinkorswim plots the price history of that particular product for the past 366 days, although the time frame is adjustable. Chart styles range from a standard bar graph to something more complex, such as monkey bars. It’s a cinch to select sub-graphs, showing volume and other indicators. But Wait, There’s More thinkorswim Tools & Screeners! The Scan interface on thinkorswim offers a number of ways to screen thousands of stocks, forex trades, futures and options according to your custom criteria. If you wish to search the market for products that meet your specifications and then receive alerts, Stock Hacker is best. The Sizzle Index pulls up high-volume stocks that might spark your interest. The Strategy Roller is designed for options traders who want to hold stocks as part of covered calls positions for long time periods. The tool automatically rolls call options forwards in time. thinkorswim provides a reference library with tutorials on how to make the most of its resources. Topics range from basic drawings to strategies. The MarketWatch interface provides market data and analysis. Within MarketWatch, you can view quotes, margin rates, receive alerts, and visualize data. You can learn by doing without any risk because thinkorswim includes paperMoney, a virtual trading platform where you can try out your ideas before you actually invest. You have a virtual margin account and a virtual IRA, each with $100,000 in faux funds, to play with. TD Ameritrade thinkorswim is available on desktop and mobile platforms. You have to download thinkorswim to your computer desktop if you don’t plan to trade on the go. The Windows version of thinkorswim works with Windows 2000 and later versions. The Mac version is compatible with OS 10.4 and above. Both require 210 MB of hard drive space for installation. thinkorswim is designed to sync with your TD Ameritrade web-based account. The two platforms complement each other well, and chances are, you will find yourself moving between them frequently. To link your different accounts, you first have to submit an authorization to TD Ameritrade. The mobile thinkorswim app is both a standalone platform and one you can use along with your desktop version by linking the two together. When you link them, you can access all your account information, funding, research, charts and trades. You can trade a full range of U.S. investment securities on the thinkorswim platform. With the help of quality data, research, real-time feeds and networking, you can trade a variety of securities quickly. Canadian residents must invest via thinkorswim Canada. A nice feature of stock trading on thinkorswim is extended hours which allows you to trade on your own before and after standard hours. It’s easy to perform due diligence prior to purchasing stocks because so many helpful resources are readily available. Options trading is the bread and butter of the thinkorswim trading platform. With the help of Strategy Roller, you can roll options forward so that they don’t expire until you want them to, allowing you to continue holding stock for the long-term. thinkorswim gives you access to more than 13,000 mutual funds on TD Ameritrade. NTF and Load mutual funds have no commission while no-load mutual funds cost $49.99. Clients have access to more than 300 commission-free ETFs. Morningstar curates the commission-free ETF selection. As with mutual funds, you can access bond trading through TD Ameritrade. Treasuries, corporates, and municipals are all available. Not sure which to trade? Check out the TD Ameritrade Bond Wizard. You can do most types of trading with the standard account. It is free to sign up and does not have a minimum deposit. You can establish a margin account by depositing at least $2,000 and maintaining that balance by adding funds for trades. Broker-assisted trades are available through thinkorswim. Naturally, you will pay extra, between $34.99 and $44.99, for a real person’s help. TD Ameritrade offers a full range of IRAs for account holders. You can deposit your investment proceeds directly to defer your taxes or hold funds for a minor or an heir. thinkorswim does not offer specialized accounts such as Canadian GICs. With 24/7 customer support available, thinkorswim provides you with excellent backup when you need it, platform troubleshooting or solutions to other related issues. Connect by phone, live chat or email anytime, anywhere. You can even drop by one of TD Ameritrade’s branch offices for in-person assistance if you prefer. A sticking point for price-conscious traders is the higher commissions costs levied on trades when compared to similar competitors in the online brokerage arena. However, plenty of customers are willing to pay more because they know they are getting more from thinkorswim than from many other platforms. Another fly in the ointment is that the trading platform is geared toward serious investors who have some experience with the market. Those who are new to trading may be scared off by all the features thinkorswim has to offer. You would have to search long and hard to find a trading platform that compares favorably to TD Ameritrade’s user-friendly yet sophisticated app. If you are serious about investing, all the research, data, breaking news, access and how-tos you might need to make smart decisions are neatly wrapped up in the thinkorswim package. It may take some dedication and a time commitment to learn enough to use this app to its full advantage, but the efforts are well worth it in our view. Your thinkorswim account goes hand-in-hand with your TD Ameritrade account. They are designed to work together and are based on the same per-trade fee structure. You can get started for free but if you want access to margin privileges you will need to deposit at least $2,000. Yes, you can open a standard account for free on TD Ameritrade. When you place trades, you pay $6.95 per transaction for stock and ETF trading. Options trades are $6.95 plus an additional $0.75. How much you invest is entirely up to you. Some independent investment products may carry their own minimums.